Gangliogliomas are well differentiated, usually low grade, neuroepithelial tumors that comprise of neoplastic ganglion cells in combination with neoplastic glial cells. Occasionally, glial cells may show anaplastic features and are then labeled as anaplastic gangliogliomas. Most of the reported gangliogliomas are supratentorial tumors, predominantly in the temporal lobe. Brainstem location has been reported infrequently. As with cortically based gangliogliomas, though the primary treatment is resection, this is often not possible due to the eloquence of surrounding involved parenchyma. Here, we report a case of brainstem tumor in an 8-month-old child that was substantially resected and was histopathologically Grade 1 ganglioglioma. As per review of English literature, there has been no case of brainstem ganglioglioma reported in an infant (less than 1 year age). We discuss the surgical difficulties in the radical excision of such benign tumors and review literature on pediatric brainstem gangliogliomas. Gangliogliomas are usually low-grade, slow growing neoplasms of the central nervous system that have biphasic histological features of neoplastic neural and glial elements. Comprising approximately 0.4% of all central nervous system tumors and less than 2% of all intracranial tumors, they are mostly supratentorial with a predilection for the temporal lobes. Nevertheless, there are reports of gangliogliomas in the third ventricle, thalamus, optic nerve, spinal cord, cerebellum, brainstem, pituitary, and pineal glands. Gangliogliomas present usually in first three decades of life and both sexes are equally affected. , In this report, we present a rare case of a brainstem ganglioglioma in an infant and discuss published literature on this entity. An 8-month-old boy presented with complaints of incessant cry and vomiting. A computed tomography (CT) scan brain at a local hospital revealed a posterior fossa tumor and obstructive hydrocephalus. In view of raised intracranial pressure (ICP), a ventriculoperitoneal shunt was performed, and the child was referred to our hospital for further management. On admission, the child was alert and did not have any clinical features suggestive of increased ICP. The child's neurological examination was normal. Magnetic resonance imaging revealed a heterogeneously enhancing large solid-cystic tumor in the fourth ventricle compressing the cervicomedullary junction dorsally [Figure 1]. A well-defined plane from the floor of the fourth ventricle or inferior cerebellar vermis could not be discerned. Differential diagnosis of exophytic cervicomedullary glioma or a vermian astrocytoma was considered. The child underwent a midline suboccipital craniectomy. The tumor was a moderately vascular grey tissue that was variably soft to firm, and was dorsally exophytic from the medulla into the fourth ventricle. A near total excision of the tumor was attempted to spare the medullary tissues, which had no clear plane from the tumor. Histopathological examination [Figure 2] revealed a combination of neoplastic ganglion cells mixed with neoplastic astrocytic cells. Immunohistochemical staining demonstrated that the pleomorphic glial cells were positive for glial fibrillary acid protein, and the neoplastic ganglion cells and the intervening stroma were intensely positive for neurofilament protein and synaptophysin. After surgery, the child had no new neurological deficits but developed high grade fever from the third post-operative day. A cerebrospinal fluid (CSF) study confirmed meningitis and the child were started on intravenous antibiotics based on sensitivity pattern. In view of persistent fever, it was decided to remove the shunt. Following shunt removal, fever subsided, and the child was continued on oral antibiotics. Ten days after surgery, the child became irritable. Examination revealed a tense anterior fontanelle and CT scan showed gross hydrocephalus with periventricular lucency. Suspecting raised ICP; the child underwent a repeat ventriculoperitoneal shunt. After this procedure, the child had an uneventful course in the hospital and was discharged 2 weeks after admission. Post-operative imaging showed minimal enhancement in the left side of the medulla bordering the cerebellomedullary fissure, and it was decided to keep the child on imaging follow-up. Though, they have been reported in all locations throughout the central nervous system, including cerebral hemsipheres, brainstem, cerebellum, and spinal cord, less than 15% are reported in the posterior fossa. 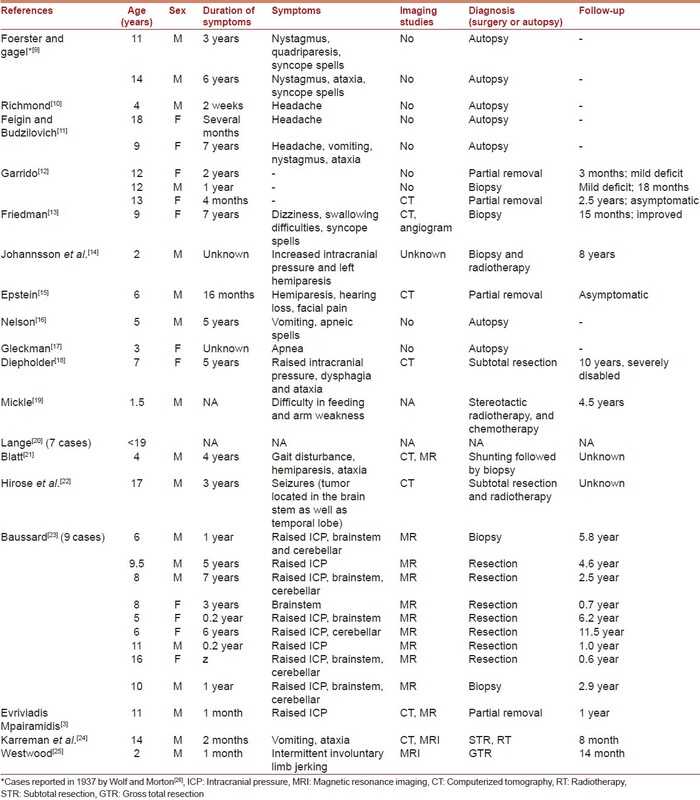 [Table 1] gives the summary of 34 previously reported cases of brainstem ganglioglioma among pediatric population (<18 years age) in English literature. None of these cases have been cited in infants (less than 1 year of age). As with other low grade gliomas, the treatment of choice for gangliogliomas is also total surgical extirpation whenever possible. Contrasting supratentorial cortical based gangliogliomas where radical decompression is relatively possible with good long term outcomes, those located in brainstem cannot be subjected to gross total removal all the time due to the eloquence of the adjacent parenchyma. However, considering their low grade nature even partial decompression offers long-term symptom relief with an adjuvant radiotherapy usually reserved for recurrent lesions. Nevertheless, surgical treatment has to be tailored for each case. The exophytic potions of the brainstem tumors can be resected whereas the infiltrating component can only be biopsied. The need for CSF diversion in the form of a shunt or ventriculostomy is also to be made on an individual basis. The issue of treatment for residual tumor is still unclear, and the various authors have adopted different strategies. Whereas some have not given any adjuvant therapy, ,,,,, others have resorted to radiotherapy and or chemotherapy only if there was evidence of large residue or tumor progression. ,,, The outcomes with both have been mixed, and the current literature has limited reports about the use of adjuvant therapy in patients with gangliogliomas as the usual supratentorially located tumors are amenable to radical excision, leaving little need for adjuvant therapies. Though, brainstem gangliogliomas are benign tumors, their exact behavior in the brainstem location is difficult to predict due to the scarcity of reports in the literature, especially in the pediatric population. However, still with the available data, a few speculations can be drawn. Farmer  and Martin  in their studies had concluded that patients with brainstem gliomas fare better if the histology points to a ganglioglioma than other glioma subtypes. In contrast to this Lange et al. in their study mention that when compared to supratentorial location, brainstem gangliogliomas have five-fold increased risk of recurrence. Baussard et al. in their series of 10 patients implicated that even though complete excision may not be possible, removal of the enhancing component of the tumor, when possible, reduces the likelihood of requiring further treatment. Finally, according to the authors the association of another benign tumor does not appear to have any impact on tumor progression. Gangliogliomas are seldom considered in the pre-operative diagnosis of pediatric brainstem lesions and is usually a diagnostic surprise following histopathological examination of the specimen. 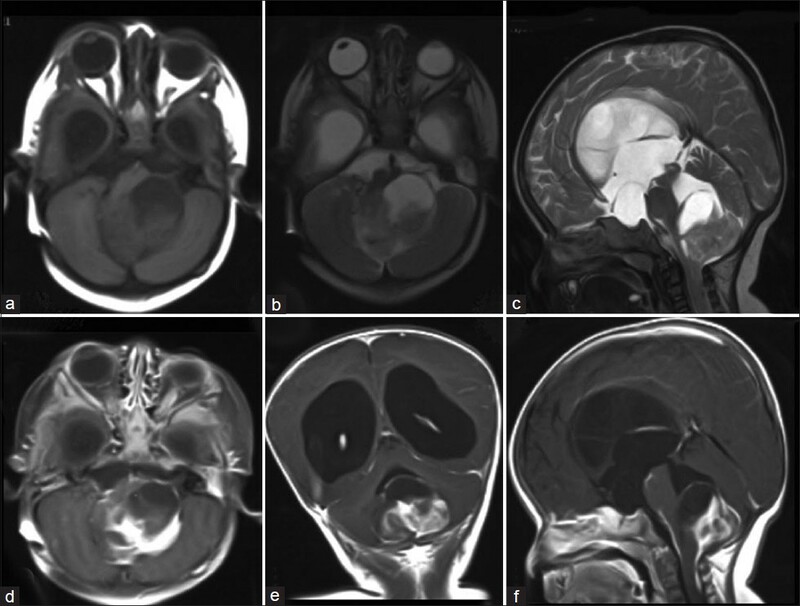 This case report highlights the need to consider ganglioglioma as a differential possibility even in infants, though extremely rare. As in the supratentorial location, they portend a favorable prognosis if maximal excision is achieved with minimal morbidity. 1. Castillo M. Gangliogliomas: Ubiquitous or not? AJNR Am J Neuroradiol 1998;19:807-9. 2. Lagares A, Gómez PA, Lobato RD, Ricoy JR, Ramos A, de la Lama A. Ganglioglioma of the brainstem: Report of three cases and review of the literature. Surg Neurol 2001;56:315-22. 3. Mpairamidis E, Alexiou GA, Stefanaki K, Sfakianos G, Prodromou N. Brainstem ganglioglioma. J Child Neurol 2008;23:1481-3. 4. Selch MT, Goy BW, Lee SP, El-Sadin S, Kincaid P, Park SH, et al. Gangliogliomas: Experience with 34 patients and review of the literature. Am J Clin Oncol 1998;21:557-64. 5. Nair V, Suri VS, Tatke M, Saran RK, Malhotra V, Singh D. Gangliogliomas: A report of five cases. Indian J Cancer 2004;41:41-6. 6. Luyken C, Blümcke I, Fimmers R, Urbach H, Wiestler OD, Schramm J. Supratentorial gangliogliomas: Histopathologic grading and tumor recurrence in 184 patients with a median follow-up of 8 years. Cancer 2004;101:146-55. 7. Becker AJ, Löbach M, Klein H, Normann S, Nöthen MM, von Deimling A, et al. Mutational analysis of TSC1 and TSC2 genes in gangliogliomas. Neuropathol Appl Neurobiol 2001;27:105-14. 8. Milligan BD, Giannini C, Link MJ. Ganglioglioma in the cerebellopontine angle in a child. Case report and review of the literature. J Neurosurg 2007;107:292-6. 9. Wolf A, Morton BF. Ganglion cell tumors of the central nervous system. Bull Neurol Inst NY 1937;6:36. 10. Richmond JG, Cunningham DL, Fuste FG, Erickson CC. Ganglioglioma of the brain stem. Am J Clin Pathol 1966;45:692-6. 11. Feigin I, Budzilovich GN. Tumors of neurons and their precursors. J Neuropathol Exp Neurol 1974;33:483-506. 12. Garrido E, Becker LF, Hoffman HJ, Hendrick EB, Humphreys R. Gangliogliomas in children. A clinicopathological study. Childs Brain 1978;4:339-46. 13. Friedman WA, Vries JK, Quisling RG. Ganglioglioma of the medulla oblongata. Surg Neurol 1979;12:105-8. 14. 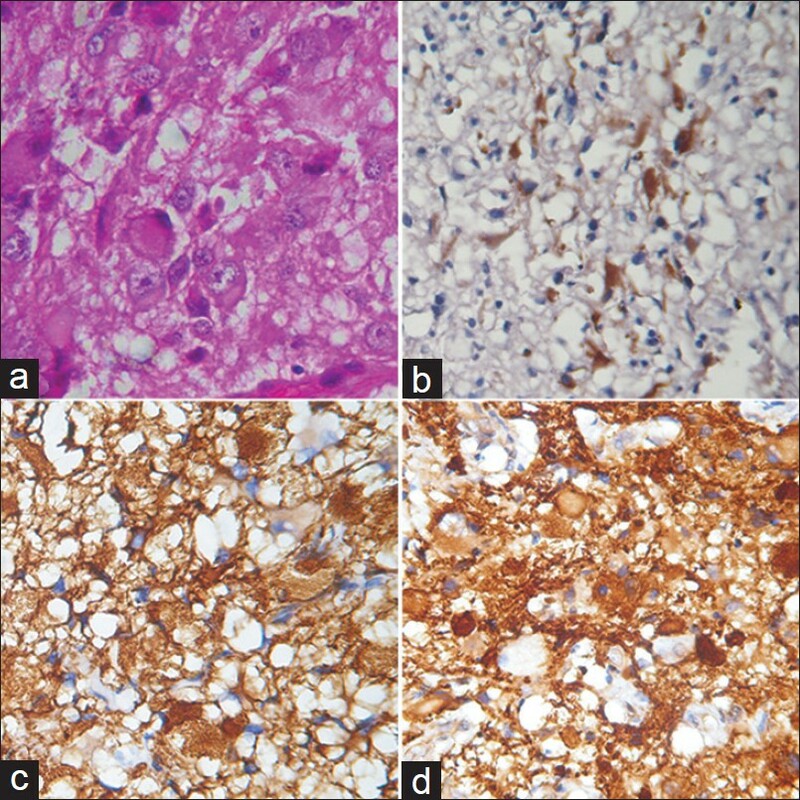 Johannsson JH, Rekate HL, Roessmann U. Gangliogliomas: Pathological and clinical correlation. J Neurosurg 1981;54:58-63. 15. Epstein N, Epstein F, Allen JC, Aleksic S. Intractable facial pain associated with a ganglioglioma of the cervicomedullary junction: Report of a case. Neurosurgery 1982;10:612-6. 16. Nelson J, Frost JL, Schochet SS Jr. Sudden, unexpected death in a 5-year-old boy with an unusual primary intracranial neoplasm. Ganglioglioma of the medulla. Am J Forensic Med Pathol 1987;8:148-52. 17. Gleckman AM, Smith TW. Sudden unexpected death from primary posterior fossa tumors. Am J Forensic Med Pathol 1998;19:303-8. 18. Diepholder HM, Schwechheimer K, Mohadjer M, Knoth R, Volk B. A clinicopathologic and immunomorphologic study of 13 cases of ganglioglioma. Cancer 1991;68:2192-201. 19. Mickle JP. Ganglioglioma in children. A review of 32 cases at the University of Florida. Pediatr Neurosurg 1992;18:310-4. 20. Lange FF, Epstein FJ, Ransohoff J, Allen JC, Wisoff J, Abbott IR, et al. Central nervous system gangliogliomas. Part 2: Clinical outcome. J Neurosurg 1993;79:867-73. 21. Blatt GL, Ahuja A, Miller LL, Ostrow PT, Soloniuk DS. Cerebellomedullary ganglioglioma: CT and MR findings. AJNR Am J Neuroradiol 1995;16:790-2. 22. Hirose T, Scheithauer BW, Lopes MB, Gerber HA, Altermatt HJ, VandenBerg SR. Ganglioglioma: An ultrastructural and immunohistochemical study. Cancer 1997;79:989-1003. 23. Baussard B, Di Rocco F, Garnett MR, Boddaert N, Lellouch-Tubiana A, Grill J, et al. Pediatric infratentorial gangliogliomas: A retrospective series. J Neurosurg 2007;107 (4 Suppl):286-91. 24. Karremann M, Pietsch T, Janssen G, Kramm CM, Wolff JE. Anaplastic ganglioglioma in children. J Neurooncol 2009;92:157-63. 25. Westwood DA, MacFarlane MR. Pontomedullary ganglioglioma: A rare tumour in an unusual location. J Clin Neurosci 2009;16:108-10. 26. al-Shahwan SA, Singh B, Riela AR, Roach ES. Hemisomatic spasms in children. Neurology 1994;44:1332-3. 27. Kwon JW, Kim IO, Cheon JE, Kim WS, Chi JG, Wang KC, et al. Cerebellopontine angle ganglioglioma: MR findings. AJNR Am J Neuroradiol 2001;22:1377-9. 28. Garcia CA, McGarry PA, Collada M. Ganglioglioma of the brain stem. Case report. J Neurosurg 1984;60:431-4. 29. Constantini S, Miller DC, Allen JC, Rorke LB, Freed D, Epstein FJ. Radical excision of intramedullary spinal cord tumors: Surgical morbidity and long-term follow-up evaluation in 164 children and young adults. J Neurosurg 2000;93 (2 Suppl):183-93. 30. Ildan F, Tuna M, Göçer IA, Erman T, Cetinalp E. Intracerebral ganglioglioma: Clinical and radiological study of eleven surgically treated cases with follow-up. Neurosurg Rev 2001;24:114-8. 31. Im SH, Chung CK, Cho BK, Wang KC, Yu IK, Song IC, et al. Intracranial ganglioglioma: Preoperative characteristics and oncologic outcome after surgery. J Neurooncol 2002;59:173-83. 32. Jallo GI, Freed D, Epstein FJ. Spinal cord gangliogliomas: A review of 56 patients. J Neurooncol 2004;68:71-7. 33. Zentner J, Wolf HK, Ostertun B, Hufnagel A, Campos MG, Solymosi L, et al. Gangliogliomas: Clinical, radiological, and histopathological findings in 51 patients. J Neurol Neurosurg Psychiatry 1994;57:1497-502. 34. Johnson JH Jr, Hariharan S, Berman J, Sutton LN, Rorke LB, Molloy P, et al. Clinical outcome of pediatric gangliogliomas: Ninety-nine cases over 20 years. Pediatr Neurosurg 1997;27:203-7. 35. Farmer JP, Montes JL, Freeman CR, Meagher-Villemure K, Bond MC, O'Gorman AM. Brainstem Gliomas. A 10-year institutional review. Pediatr Neurosurg 2001;34:206-14. 36. Martin LD, Kaplan AM, Hernried LS, Fisher BJ. Brainstem gangliogliomas. Pediatr Neurol 1986;2:178-82.